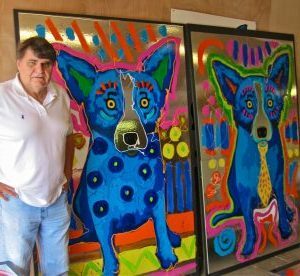 Located in the vicinity of Tulsa, Oklahoma, the Sand Springs Cultural and Historical Museum will host the exhibition The Art of George Rodrigue: Shiny Happy Blue Dog, highlighting George Rodrigue’s painted artworks on metal. The installation of twenty original artworks marks the first-ever George Rodrigue exhibition in Oklahoma. The works within this exhibition are drawn exclusively from the Rodrigue Archives and the artist’s private collection. Also included are selections from his Swamp Dogs and Hollywood Stars series, which combine Rodrigue’s love of reflective metal surfaces with painting, photography, and modern technology. Throughout his career Rodrigue aligned himself with Surrealism, Pop, and Abstract Art – associations that are increasingly obvious in these later works. From his earliest Oak Trees to these late works on chrome, Rodrigue’s art was his own form of ‘contemporary,’ reflecting a romantic connection with his cultural heritage intertwined with his individual experience, his artistic sensibility, and his unique world-view. 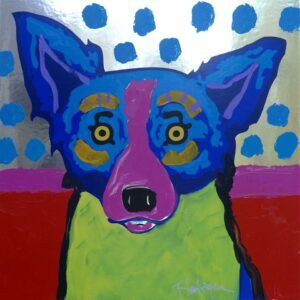 Finally, while it may be challenging without the luxury of a career-retrospective to fully understand Rodrigue’s development from Cajun landscapes to this body of work, it would be out of the question for anyone to view these vibrant, compelling artworks and not come away with a sense of nostalgia and wonderment — and a description of Shiny Happy Blue Dog. 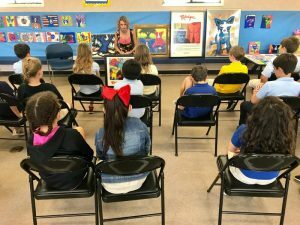 Wendy Rodrigue will be at the Sand Springs Cultural and Historical Museum for a Gallery Talk, Reception, and Book Signing on November 17th at 5:00 p.m. Free and open to the public. In-person interviews with Wendy Rodrigue, Bethany France, and Sandy Kent will be available on November 15, 16, and 17.